Mallrats (Kevin Smith, 1995) - Having both been dumped by their girlfriends, best friends T.S (Jeremy London) and Brodie (Jason Lee), decide to drown their sorrows at the mall. However, their situation is made all the worse when it turns out that T.S. 's girlfriend, Brandi (Claire Forlani), is participating in the mall dating game show whilst Brodie's ex, Rene (Shannen Doherty), has begun dating sleazy store manager Shannon (Ben Affleck). Feeling jilted, the pair begin seeking out ways to ruin the game show. Who could forget that famous Easter bunny scene? Mallrats was the first film that came to mind when thinking about an alternative Easter movie. Very much known as a cult classic amongst Kevin Smith fans, the film has an incredible cast who went on to feature as amazing characters in Smith's later films. 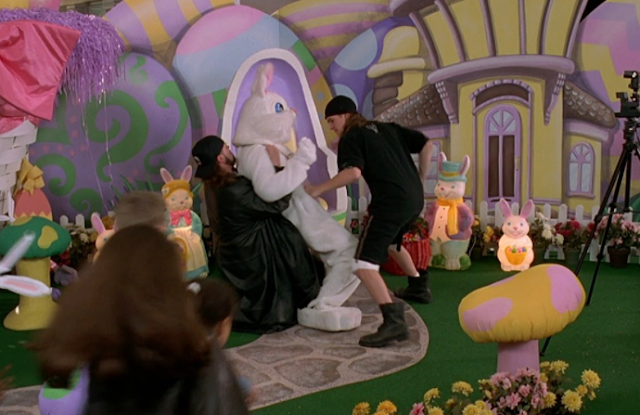 The main highlight for me, besides the obvious Easter bunny scene, is very much Jason Lee as Brodie - who's dialogue is what truly makes Mallrats so hilarious. Despite it's low budget, the excellent writing and performances mean that this will forever be an Easter classic to enjoy all year round. "Say, would you like a chocolate covered pretzel?" Rebel Without A Cause (Nicholas Ray, 1955) - Jim Stark (James Dean) is a rebellious young teen who moves to a new town with hopes of a fresh start. However, being the new kid in town brings its own problems. Stark soon forms a bond with a seemingly disturbed classmate, Plato (Sal Mineo), and falls for local girl Judy (Natalie Wood). However, Judy is the girlfriend of infamous bully, Buzz (Corey Allen) who violently confronts Jim; challenging him to a drag race and kickstarting a series of dangerous events. OK, so this may be cheating slightly but there are several points in the film which reference that it set around Easter and spring time. The film is arguably James Dean's most iconic and memorable performance although he tragically died before its release. 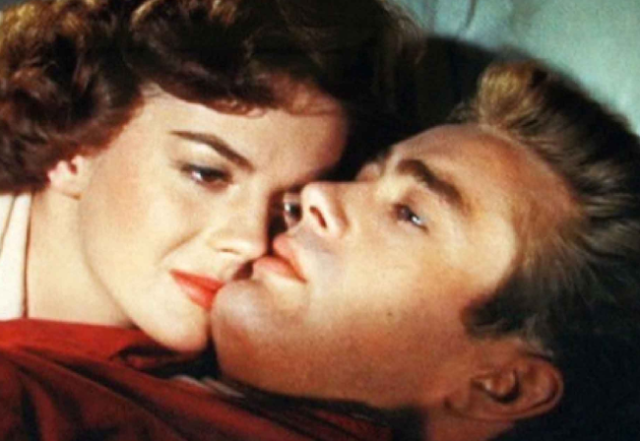 If you can suspend your belief for a moment as a 24 year old Dean plays a teenage boy, at the centre of Rebel Without a Cause is a great deal of heart and social context. Made in the 1950s, Rebel was incredibly ahead of it's time - exploring themes of homosexuality, examining masculinity and ultimately appealing to anyone who's just looking to be understood and fit in. Of course, there are some scenes which show it's age but it's well worth the watch - a true 1950's classic and a reminder of Dean's legacy. 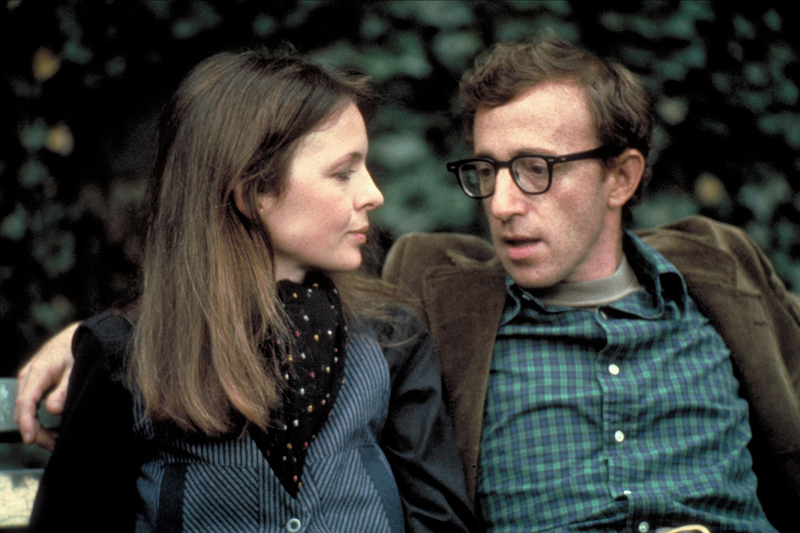 Annie Hall (Woody Allen, 1977) - Breaking the fourth wall, Alvy Singer (Woody Allen) is a comedian looking back at his relationship and "nervous romance" with a struggling nightclub singer, Annie Hall (Diane Keaton). Reflecting back briefly on his childhood and his early adult years, Singer tells the story of how he and Annie met, fell in love, and faced obstacles of modern romance, mixing surreal fantasy sequences with small moments of emotional drama. I'll be honest - the first time I saw Annie Hall I didn't particularly like it. I'm also very much on the fence with some Woody Allen films but having given it another go in later years, I'm comfortable including it in my Easter run down. Again set around Spring and featuring some scenes from Easter dinner, Annie Hall is arguably one of Allen's most iconic films to date. Having put himself in the starring role along side Oscar winner Diane Keaton and playing a stand-up allows Allen to truly showcase his screenplay and witty one-liners which make this film so memorable. If you like dry humour and a whole host of incredible actors - maybe give it a watch. Donnie Darko (Richard Kelly, 2001) - Having survived a freak accident, Donnie (Jake Gyllenhaal) begins to question his existence and explore what it means to be alive. However, since the accident he is plagued by strange visions of a man-sized rabbit named Frank. Manipulated by his hallucinations, Donnie commits a series of crimes in is neighbourhood whilst blurring the realms of time and space. Now seen as a cult classic, Donnie Darko was actually quite the flop at the box office but it did receive wide spread recognition from religious (in particular Catholic) viewers. 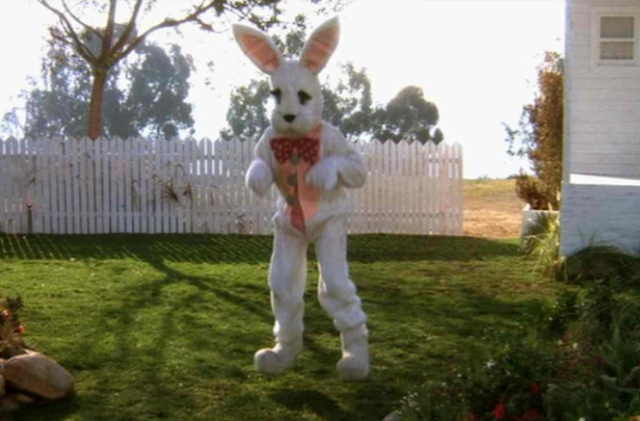 It is argued that Darko features several religious comparisons and is said to feature strong themes of Lent throughout - not to mentioned a giant invisible bunny rabbit which only Donnie can see. 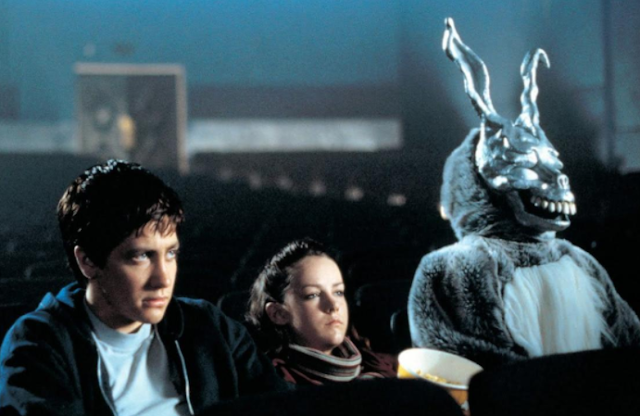 As well as an incredible performance from a young Gyllenhaal, Donnie Darko is a truly unique and obscure masterpiece which remains high on the lists of critics. 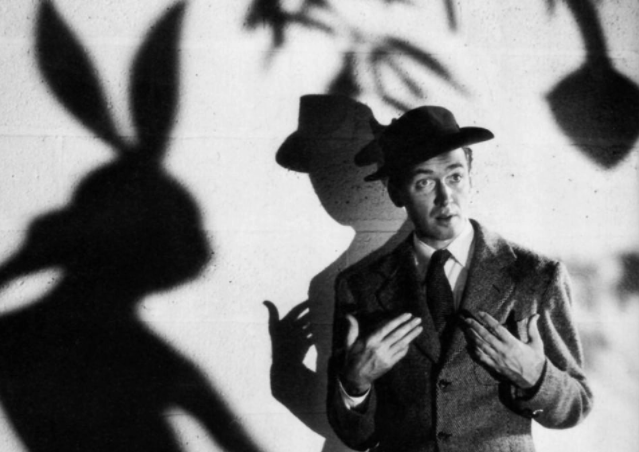 Harvey (Henry Koster, 1950) - Elwood P. Dowd (James Stewart) is a wealthy dreamer who starts having visions of a six foot, three inch rabbit named Harvey. His sister, Veta (Josephine Hull), quickly worries that Elwood has gone insane and has him admitted to an asylum despite having seen Harvey with her own eyes. Based on the Pulitzer Prize Play by Mary Chase, Harvey is a fairly light-hearted comedy drama, despite it's themes of mental health. Starring the iconic James Stewart for which he received an Academy Award nomination for his role, Harvey is far more intelligent than it may first appear - with a great amount of depth and heart. Whilst the production value is certainly aged and the script is a little laboured, the premise of the film remains memorable and perpetually intriguing. Monty Python's Life of Brian (Terry Jones, 1979) - Brian Cohen (Graham Chapman) is an average young Jewish man who, through a series of ridiculous events, accidentally gains a reputation as the Messiah. Being stalked by his growing number of followers, and with the Roman hostility towards Christianity, Brian has to contend with the pompous Pontius Pilate (Michael Palin) and acronym-obsessed members of a separatist movement. I'm pretty sure they've banned from having this on UK television over religious holidays now but I can't not think of the Life of Brian when it comes to Easter movies. 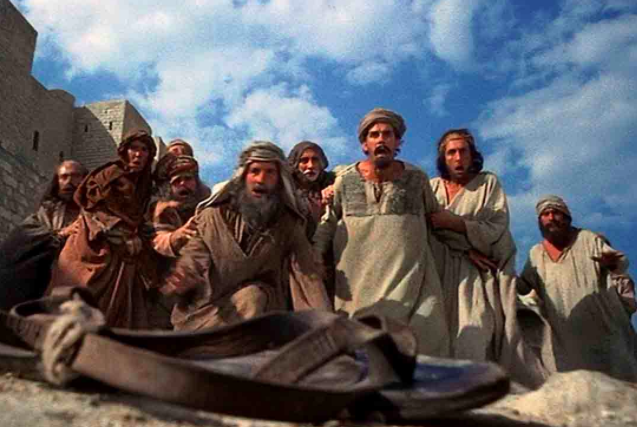 In the true nature of all Monty Python films, it is utterly silly but also incredibly intelligent in it's humour and says a great deal about the comedic group's ideas of religion. Having watched it as a child and now as an adult, I'm forever finding new jokes and new meanings behind them that never grow old. With it's fantastic writing and witty one liners, it is widely considered to be one of the most brilliant comedies of all time. Critters 2 (Mick Garris, 1988) - A sequel to Critters (Stephen Herek, 1986), eggs of the small furry alien carnivores are left behind on Earth and, after hatching, set their appetites on the town of Grover's Bend. Based purely on a scene where an Easter bunny gets horrifically eaten by these crazy puppets, Critters 2 makes it on to my list. If you've seen any of the four Critters films, you'll know they are incredibly ridiculous and utterly hilarious. Depending on your taste in horror, they are the worst or best horrors ever made and well worth seeing if you're looking for a laugh or a good eye roll. It's also worth mentioning that a young Leonardo DiCaprio stars in the third film alongside some other famous faces. Fatal Attraction (Adrian Lyne, 1987) - Dan Gallagher (Michael Douglas) has it all - he's a successful New York lawyer, he's happily married and has the love of his devoted daughter. However, he risks it all when he enters in to a casual affair with Alex (Glenn Close). When the relationship comes to an abrupt end, Alex becomes unstable and goes on a warpath of obsessive stalking which leaves Dan fearing for his life and his family's safety. Ever heard the phrase "bunny boiler"? Well, this is where it came from. That's pretty much the only Easter themed link I could find with this particular feature but it's a rabbit none the less. In this twisted tale, Glenn Close gives an absolutely stunning and believable performance as a women scorned and gone bad by the mistreatment of her married lover. It features some truly intense and heart-pounding moments and remains one of my favourite thrillers. Shame about the bunny though. 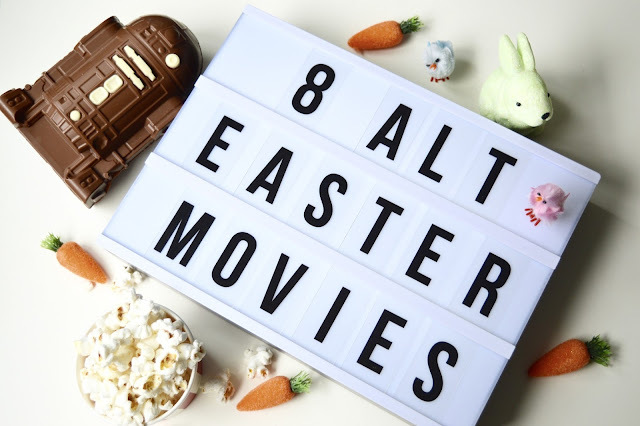 Well, that's it for my list of alternative films to watch this Easter. Can you think of any that are missing from my list? What films will you be watching over the Easter break? As always, I love reading your comments so please do leave me lots of lovely ones down below. Until next time film fans - Happy Easter! Omg I forgot about Mallrats, haha. Thanks for the recs! Haha, yes amazing collection of film picks here! 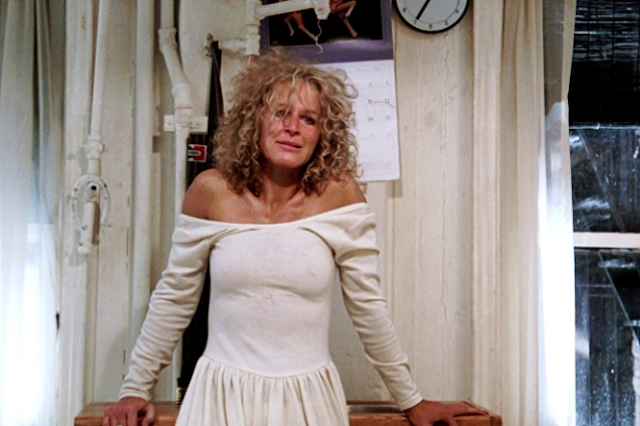 Serious nostalgia right now, need to re-watch Fatal Attraction. and choose your story games online free. Hope you enjoy it.